Making a differential diagnosis between schizoaffective disorder with major depressive episode and paranoid schizophrenia is difficult. The patient is at the threshold of neurotic versus psychotic, the intensity of ideation phenomenon being very high and specific to both disorders, it is required an assessment based on life and disorder history information, but also the emotional presence of the patient in the clinical interview. In this case study we suggest a literature comparison but also an evaluation profile of the disorder, marked by a psychiatric illness in which the person shows both affective symptoms (depressive or maniac) and symptoms of schizophrenia (such as delusions, hallucinations). Hypothesis: symptoms of the patient are oscillating between paranoid elements (paranoid schizophrenia) and affective elements (schizoaffective disorder). These oscillations are based on a fragile Ego structure with cognitive rigidity. The study outlines an immature-dependent personality profile, based on interpretativity, with passive-aggressive elements, hypersensitivity, psychotic operation and through psychotic elements manifested in the past (auditory hallucinations, as voices). Also, the basis of the transfer and counter-transference elements identified, the emotional resonance is low, with a risk of psychotic decompensation. Conclusions: Depressive schizoaffective disorder is characterized by presence of both depressive and schizophrenia symptoms in the same time period. Depressive symptoms includes: depressed mood, reduced interest, sluggishness, low energy, difficulty concentrating, insomnia, feelings of despair. During the same episode are present symptoms of schizophrenia: hallucinations, delusions of control, state of hyper-vigilance, delusions injury. Clinical examination cannot be a chance encounter because the history of mental suffering tight interfere with subject's essential history in that it creates a gap and that subjectivity psychiatric symptoms inferred immense emotional and personal participation of the subject. Introduction- Lipoma is the most common and most widely distributed tumor seen in the body. The most common clinical presentation is a gradually increasing, soft and non-tender mass. These tumours are very rare in hands and if they are present then they are of small size and usually one in number. Herewith we are presenting a case of Palmar Lipomatosis which had a large tumour and 4 small size tumour in same palm. 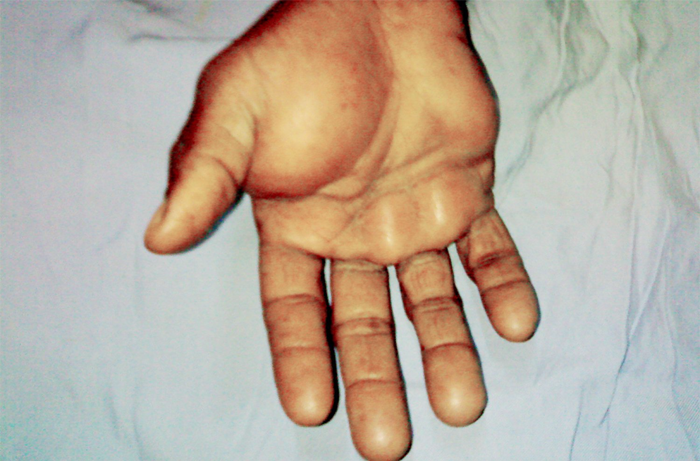 Case report- Herewith we are reporting a case of a 40 years old female, presented with the complaints of multiple swellings in the right palm. She first noticed a small swelling on the thenar aspect of palm about 1½ years back; which was slowly, progressively increasing in size since then. Meanwhile patient also noticed some other swellings in the same palm. Incisions were given over thenar, hypothenar and at the bases of finger. All the tumors were removed en-masse. Biopsy report was fibrolipoma. Conclusion- Palmar lipoma is very rare tumour. Palm has very limited space for these tumours to grow but still these tumours can be found in palm. Very limited case reports about the lipoma of hand are present in literature. Here we presented a rare case of palmer lipomatosis which has multiple lipomatous swellings in same plam. They were removed successfully without any residual deformity.